Easter Sunday is almost upon us -- one week left! Easter means many different things to many different people and conversely is celebrated a myriad of ways. For Christians it celebrates the resurrection of Jesus. Easter is also linked to the Jewish Passover. For others it brings up visions of Peter Rabbit hopping down the bunny trail passing out easter eggs, chocolate bunnies and marshmellow peeps (my daughter's favorite). For the White House, it means the annual Easter Egg Roll -- a tradition on the White House Lawn since 1878. While for the working class, it means a day off (Ya!) and for the little ones, no school! I have fond memories of Easter Egg Hunts in my youth, so I've brought it to La Musique. I've placed 7 easter eggs all around the island. Find each one and receive a small monetary award, along with a prize! In between searching for eggs, come check out the Easter items that are up for sale. We have an adorable easter basket that has two chocolate (yum!) bunnies nestled between colorful eggs and tulips in a finely-craft purple wicker basket. You'll also find some cute stuffed bunnies as well as some easter eggs. All at reasonable prices. Let that special someone know you are thinking of them this holiday!! 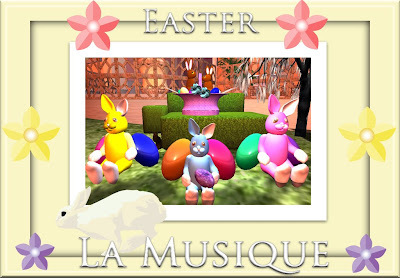 However you celebrate Easter, come to La Musique to purchase your easter items or participate in the easter egg hunt.